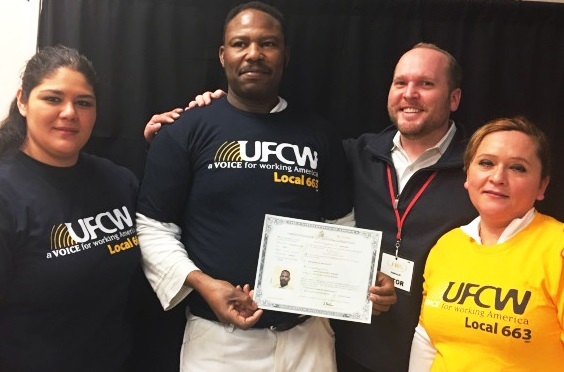 UFCW Local 663 hosted Union Citizenship Action Network (UCAN) workshops in Worthington, Minnesota, on January 24 and 25 to help members who work at the JBS plant in the area with the application process for U.S. citizenship. Over 50 members attended the workshops, which focused on legal services, the process to become a citizen, and other immigration and citizenship issues. UFCW Local 663, in cooperation with JBS, held the workshops onsite at the plant, where representatives from the Immigrant Law Center of Minnesota and UFCW International provided legal assistance to members regarding the naturalization process. Fourteen members received assistance filling out their naturalization applications, which is the beginning of the process to becoming a U.S. citizen. UFCW Local 663 is planning to hold quarterly UCAN workshops throughout the year for its members at the JBS plant in Worthington. The local is also working with United Latinos of the UFCW, which offers scholarships to help members offset the cost of citizenship filing fees through its New American Citizenship Fund. The UCAN program, which was launched in 2014, assists members who are lawful permanent residents and meet the legal requirements with their application process to become U.S. citizens. Since its inception, the UCAN Program has helped thousands of our members and their families with their citizenship application process. For more information or to get involved with the UCAN program, contact International Vice President and Director of the Civil Rights and Community Action Department Robin Williams at rwilliams@ufcw.org.